Local articles older than two weeks are not available in this search; call 903-596-6397 for information on how to access articles older than two weeks. Jennifer Downs has been scrapbooking since she was 12 and a few years ago looked for a place she and girlfriends could for a weekend to work on their craft. But she had a difficult time finding a decent place with nice amenities where they could go for a crafting retreat, she said. She and her husband of nine years, Jereme, graduated college with business degrees and worked as IT consultants when they came up with the idea to start Memory Lane Inn -- a bed and breakfast where women can come to scrapbook, quilt, paint or do other crafts. Mrs. Downs, 35, of Prosper, opened her first bed and breakfast in McKinney in 2008 in a rustic, country-style home that fits 12 women. Two years ago, she added a second retreat in an historic home on Tyler's brick streets. Mrs. Down's parents, Jean and Ed Nolen, a school bus driver, run the Tyler bed and breakfast, which can house up to 18 women and can be rented out on the weekends. The Tyler house, at 505 S. Chilton Ave., was built in 1904 and has been lived in by Sen. Earle B. Mayfield and Miss America Jo-Carroll Dennison, Mrs. Nolen said Wednesday while giving a tour of the home. Mayfield was a lawyer and Democrat who served in the Texas and U.S. senates. After leaving the U.S. Senate in 1929, he practiced law in Tyler and was president of Mayfield Wholesale Grocery Co. He bought the house in 1942 and employed Ms. Dennison to clerk in his law firm and she reportedly occupied one of the rooms at the home. Ms. Dennison was Miss Tyler, Miss Texas and Miss America, and went on to become an actress, according to www.memorylaneinn.com. The house has also been used as a boarding house during the Depression, Mrs. Nolen said. The late Dr. Steve Riley and his wife Judy did a lot of the renovations to the historic house and opened it as a bed and breakfast in 2003 before Mrs. Downs bought it two years ago, she said. The inn can fit up to 18 guests. "They all get along well because they're doing exactly what they want to be doing," Mrs. Nolen said. If patrons book a weekend -- from Friday through Sunday for $145 -- they get to stay Thursday for free. They can also add Wednesday to the stay for $25 more, Mrs. Downs said. Mrs. Nolen will cook meals for the Tyler guests for an extra charge and Memory Inn Lane can arrange for a massage therapist or a craft teacher to come out to the inn. Mrs. Nolen isn't into crafts but enjoys cleaning and cooking for the guests. On Wednesday, she was preparing to make lasagna, salad and homemade banana pudding for guests on Thursday. Mrs. Nolen was a personal cook for a woman in Temple for 10 years before she and her husband moved to Tyler to run the bed and breakfast for their daughter. Mrs. Downs grew up in Desoto and runs the bed and breakfast in McKinney while her husband works as an IT consultant. She said the McKinney location is good for the inn because it sits in the country on one acre surrounded by horses, but is only about five minutes from a large crafting supply store and all the conveniences of a city. Mrs. Downs said people have been very receptive to the inn, which stays booked about a year out and its business has been all from word of mouth. "It makes us feel like we're doing something right," she said. The McKinney inn has seen guests from Oklahoma, Louisiana and Arkansas, and women as far away as California and Germany. She said they decided to open a second bed and breakfast in Tyler because they loved the city and thought it would be a good fit for their clientele. She said when they saw the house on Chilton, they fell in love with it and knew they made the right decision. She said business in Tyler started at a slow simmer but has begun to pick up, "going to a boil." Mrs. Nolen excitedly pointed out the unique features of the Chilton house, including the wall papered ceiling in the kitchen, two twin stain-glass doors reportedly imported from England, a circus glass chandelier and a fire place made of tiles with yellow roses in the dining room. There are five bedrooms and a sixth is used as a TV room. The main room that once housed a sitting parlor downstairs is where crafts are made. The bottom bedroom, named "First Ladies Quarters," and an upstairs bedroom, called "Angel's Wings," offer murals on the ceiling painted by Theresa Cheek. The other two bedrooms are named "Miss America's Boudoir" and "Senator's Chambers" for the past residents. Mrs. Nolen said the house is filled with a lot of antique furniture and all of the hardwood floors upstairs are original. Outside, guests can take their breakfast in a sitting area or relax in the gazebo and enjoy the pond. "It's a beautiful home," she said. "It's been restored lovingly and we try to keep it in the same fashion." Memory Lane Inn provides guests some scrapbooking tools but a lot of women bring their own crafting supplies. "I've seen a U-Haul back up into here, literally," Mrs. Nolen said. "I'm always amazed." She said scrapbooking is an expensive hobby "but they love it and they have fun." She said while scrapbooking, the women make beautiful photo albums and she has seen ladies spend a whole weekend on one page. Memory Lane Inn in Tyler has had guests from as far away as Indiana, Oklahoma and Louisiana but many come from the Dallas area and women in Tyler have started coming for weekend retreats. Mrs. Nolen sees 70 to 80 people stay at the Tyler house each month. 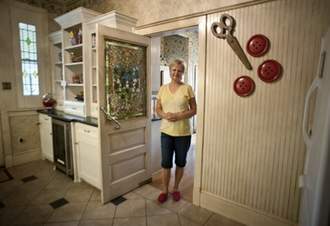 Jean Nolen runs the Memory Lane Inn bed and breakfast in Tyler. Below, the Angels’ Wings room at is one of several rooms guests can book during their stay. The Inn markets itself as a retreat for scrapbookers and other crafters.